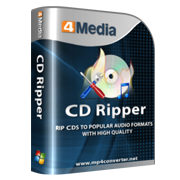 4Media CD Converter is a comprehensive CD soundtrack extractor capable of converting CD to MP3, WMA, WAV, AAC, FLAC, OGG, APE and other popular audio formats, making it possible to play CDs on different music players. And it also has the ability of transferring the outputted music files to iPod, iPhone and PSP directly after converting. Moreover, 4Media CD Converter provides you with different audio effects (incl. fade-in/out, normalize, band pass, chorus, flanger, echo and speed) for your adjustment, and also allows you to convert one audio track to multiple format music files at once, split audio tracks, clip music segments and so on. Give 4Media CD Converter a free trial and play CDs on any media players now! Convert CDs to different audio formats including MP3, WMA, WAV, AAC, FLAC, OGG, APE, making CDs playable on various music players portable or on your computer. Not only convert multiple CD tracks to different audio formats at once, but it also can convert one track to multiple audio files simultaneously. After converting CD to music files, the CD Converter can transfer these music files to iPod, iPhone and PSP directly. Allows you to adjust the effects of your music files including fade-in, fade-out, normalize, band pass, chorus, flanger, echo and speed. Specify or customize a split mode prior to convertping, then the CD Converter will split a single track into several parts automatically. 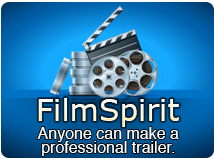 Clip any audio segments from CD audio tracks and convert the audio segments to any supported audio format. Lots of output parameters are adjustable; ID3 tag info of your audio tracks can also be editable. Fully supports multiple CPU cores and multiple threads, making the CD convertingspeed accelerated greatly. Make the CD Converter work in the background to spare CPU resources for other applications. You can make the program exit, shut down, hibernate or stand by system automatically after CD converting. 4Media CD Converter is available in English, German, Spanish, French, Japanese and Chinese languages.